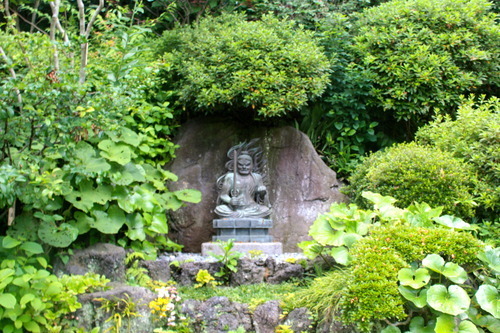 Before I started taking Japanese culture classes at Puget Sound, it was hard for me to imagine Kamakura without calling to mind scenes from the samurai revenge tales I used to read as a young teen, many of which were set in the former shogunate capital. Seeing it today, I understood how in Kamakura, as in many historically significant Japanese cities, hordes of hasty sightseers seem to push time ever forward with their very presence. Yet in a few small pockets, where crowds are not, time feels at a perfect standstill. Alone with the ancient places, imagining the monks who used to bow and pray there, the samurai who used to pass through red torii to pay homage to their gods before battle, my mind feels free enough to forget what Japan is and consider what it used to be. 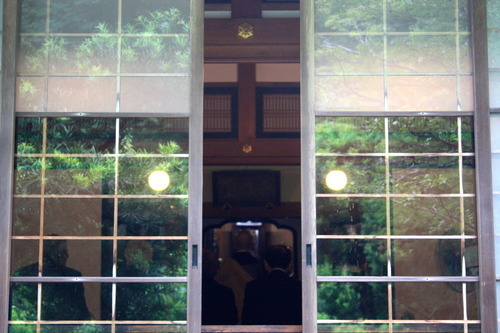 However, at the first stop of my trip with fellow IES Tokyo students, which was ironically a Zen temple known as Enkaku-ji, I discovered this was a difficult state to attain. The temple grounds were beautiful, full of eroding, moss-covered bodhisattva icons, immaculate gardens and humble shrines, but it was hard not to misstep and nearly clip someone’s shoulder with the amount of people shuffling throughout every space. In the cemetery, I was particularly struck by the “triforce” symbol which adorned many of the headstones and nearby roof tiles. As a huge fan of Nintendo’s popular series, The Legend of Zelda, which features the triforce as an object of immense power, I was overjoyed to see so many of them in one place. “Holy triforce!” I said as I saw this one in particular. Needless to say, many jokes about finding the entrance to “The Water Temple” were promptly made. 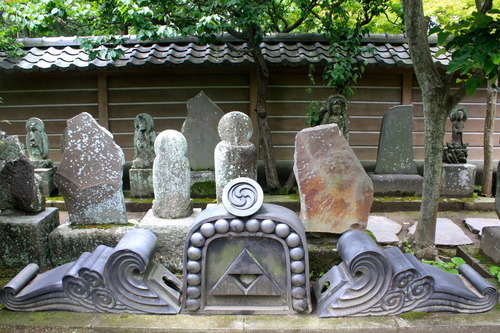 Later on, I found out that the triforce was the symbol chosen to signify the family who built Enkaku-ji. 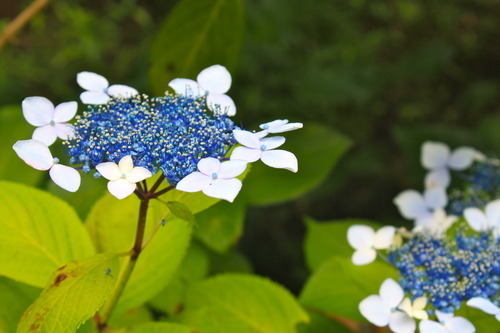 My favorite moment occurred while passing through a quiet garden at the top of the temple grounds, where there were many tiny shrines and blooming flowers to admire. 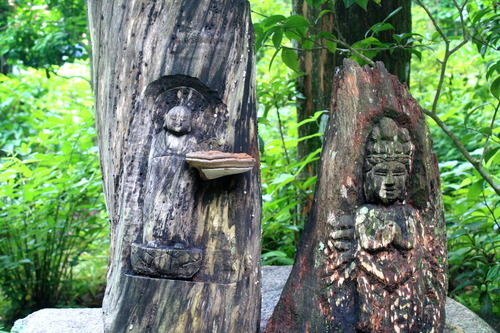 On my way out, what I had assumed to be merely a couple of tree stumps at first glance turned out to be beautiful carvings of some bodhisattvas. 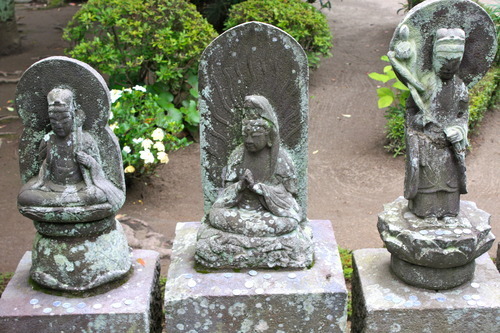 Something about their minimalistic, preserved natural beauty really struck me, much more so than any other bodhisattva icons I’ve seen elsewhere in Japan. Then, drawn down the hill by a thick waft of incense, I stopped by a small temple on the way back to our bus where a monk was leading a Buddhist service. Having ten minutes to spare, I watched and admired their solemn procession, without knowing what was being chanted or what it meant. But most of all, it was quiet and that was what I felt I needed at the time, after a morning of such commotion. 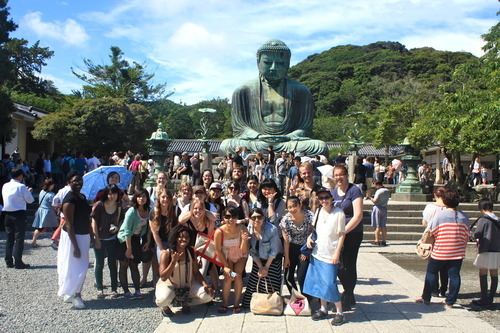 After a quick bus ride, we arrived in central Kamakura where most of us split off into our respective groups of friends and headed off to lunch. Thinking of our wallets more than our palettes, we chose a place off of the main drag where we were (miraculously) able to purchase a meal for under $10. I enjoyed a full plate of delicious fried rice for $7 while my friends, primarily, bought ramen and curry. Our stomachs full but not full enough, we got some ice cream and then checked out a few random shops. The most notable place we visited was a top-tier soap shop where we tried out their squishy, gelatinous soap which somehow felt more effective than any regular soap I’ve ever used. It being Father’s Day on the June 16th, I also began window shopping for something my host father might want around the area. Eventually, with the help of my Japanese friend Yuna, I decided on some sleek but masculine red and black chopsticks, handmade in Kamakura. Naturally, we had to take both a normal and silly group picture before we even reached the steps. 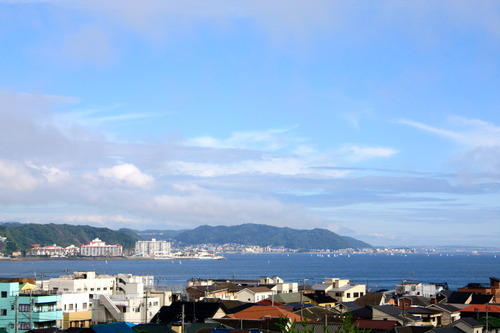 I think the falsely projected weather report of a typhoon went to our heads because everyone seemed much giddier than usual, even for a beautiful sunny day. Maybe the Great Buddha simply decided to bless our visit with good weather for the day. The sheer, awesome size of this Buddha was enough for me to remember it as one of the more impressive monuments I’ve ever seen; his face alone is about 9-feet-wide. I made sure to submit my offering, bow and pray earnestly for enlightenment before I headed back to the bus. 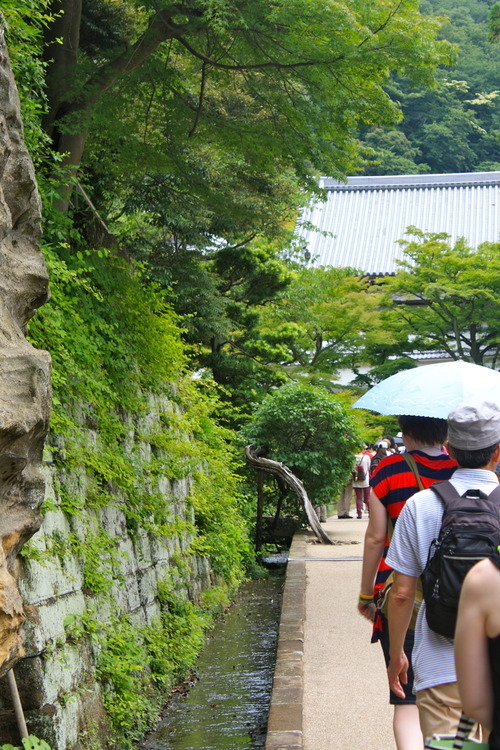 Finally, we reached our final stop at Hase-dera Temple, featuring mysterious cave shrines, vivid flowers and beautiful hilltop views of the entire area. 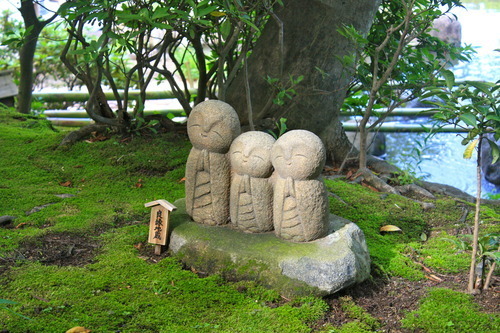 First, I shambled around the opening shrine area and perused the iconography, looking for something new to learn about. 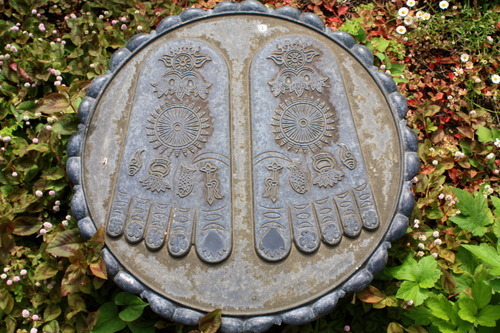 I found this, unfortunately without finding out what it represented, but I would take a guess that it has something to do with walking the Eightfold Path, as Shakyamuni Buddha once did. 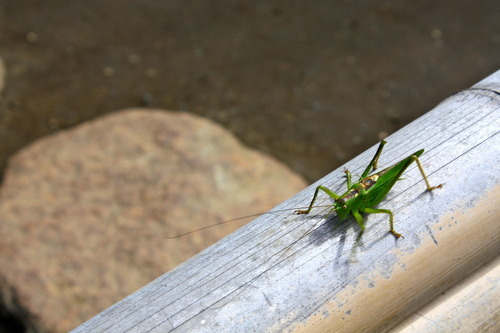 I couldn’t help but think of that line when I met this not-so-young-or-little grasshopper in the garden. 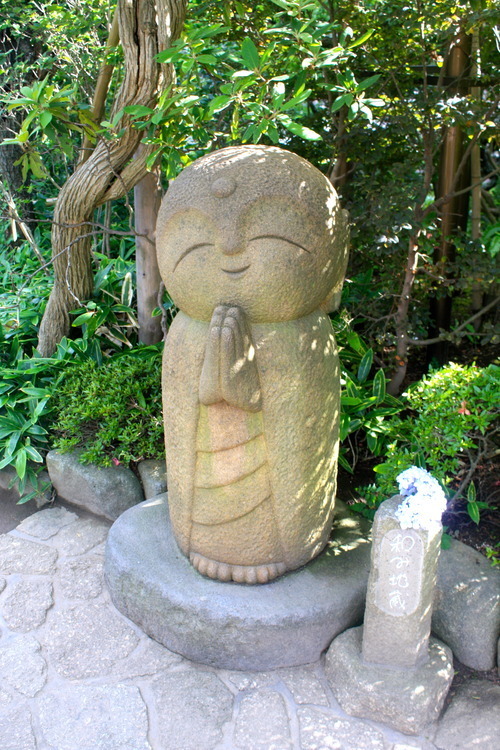 Then, as I began climbing up the steps to the temple’s topmost site, I noticed many jizo statuettes along the way. 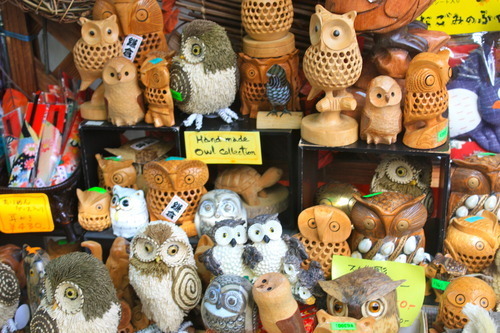 These ones in particular reminded me of the cute, bobble-headed forest spirits, also known as kodama, from Hayao Miyazaki’s acclaimed environmental fantasy, Princess Mononoke. 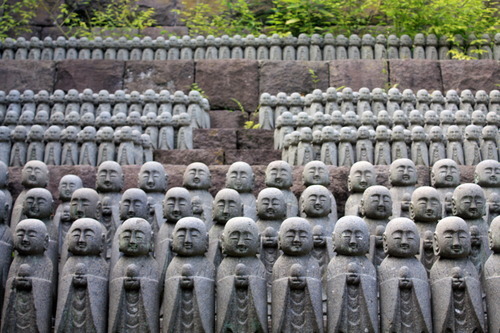 However, further up the steps, I found many of the statuettes in perfect formation, which struck me as vaguely unsettling and creepy. By the time I reached the top though, I was relieved to find a mist machine and a row of vending machines to settle my dehydrated delirium. Peeling away from the group, I took some time to appreciate the neighboring flowers which were so bright that they seemed as if they would be more at home in Alice in Wonderland than in real life. 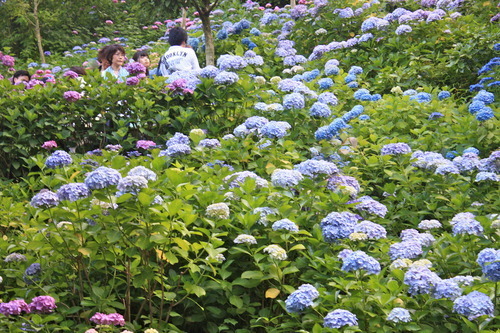 Circling around the temple’s archaic rotating barracks, the flowers formed a stunning wall of purples, pinks and blues. 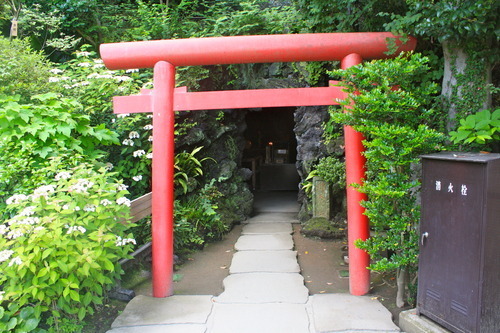 Before heading to the gift shop, we all met up again to pass through the temple’s cave shrines. Although the entrance was guarded by a fierce, fiery oni, or “demon,” icon, we ventured inside to find a variety of holy deities from the Buddhist pantheon. Having to crouch down through most of the tunnels, I was reminded how small people must have been when they started using them for worship thousands of years ago. 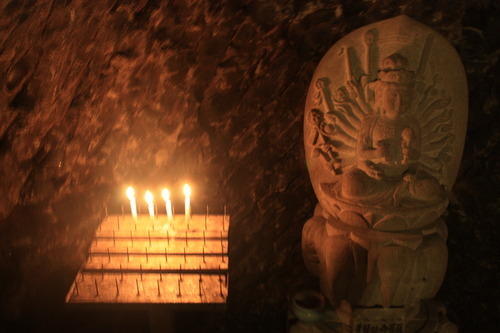 The idols looked old and the cave itself smelled even older. Rainwater dripped down through the cracks of the rocks and dribbled over many of the icons, given them a worn but smooth appearance. As we emerged into the sunlight again, we were disappointed to have forgotten how hot it had been before we entered the cool dampness of the cave. So without further ado, we returned to the bottom and browsed around the gift shop. Since one of my friends is technologically inept and therefore difficult to reach, I decided to write him a postcard and correspond that way instead. As an admirer of all things kawaii from Japan, I thought he would appreciate a postcard depicting this cute jizo statue from the temple. Strangely enough, just as we got on the bus and started heading back toward Tokyo, rainclouds rolled into the bay and delivered a downpour. Maybe the Great Buddha really had blessed us after all, just so that we could see him in all his glory, with the sun projecting halos behind his back. 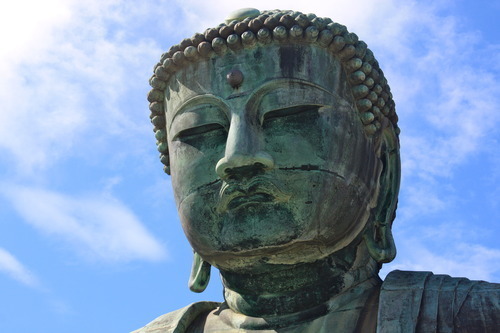 This entry was posted in Tommy Stone '14, Japan and tagged blog, buddhism, japan, kamakura, temples, travel. Bookmark the permalink.